Joyful Baby Joey Waves To Everyone In Her Path To Share a Little Love. Almost everyone loves babies. Most of the time, they make us joyful by their sweet works and bubbling. 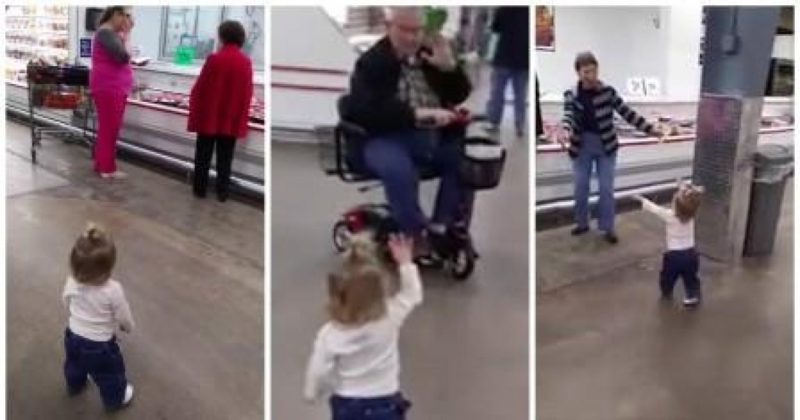 A little girl spreads the love to supermarket shoppers - and millions of people online - in this adorable clip. Little Joey is only 16-months-old and probably doesn’t appreciate how tedious shopping for groceries can be..
She wants everyone else to be happy too! It’s hard not to smile as Joelle, confidently walks through a crowded supermarket smiling, waving and hugging delighted shoppers. Mom Caitlin caught this quick snippet after nearly half an hour of Joey’s antics. With nearly 50 million views on Facebook, her infectious mood has now spread far beyond this Arkansas supermarket. In the adorable video you’re about to see, a toddler named Joey walks around a grocery store and waves and offers hugs to the shoppers and staff. Her mom follows behind with a camera and catches the whole thing one tape. As you can imagine, she instantly puts a smile on everyone’s face that she meets. And watching this video put me in the best mood too, so I thought I’d share it here.